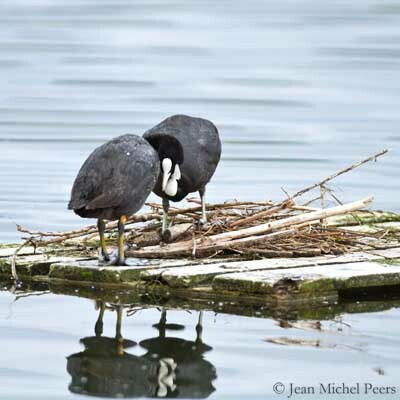 Very common on lakes, ponds and rivers of the Old World, the Common Coot has expanded its range to other countries and continents. This species can be seen in large flocks. 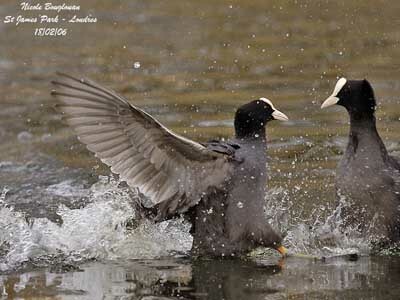 Their territorial fights are famous and spectacular, with the coots running fast over the lake and raising beautiful showers of water. Both adults are similar, with female slightly smaller than male. 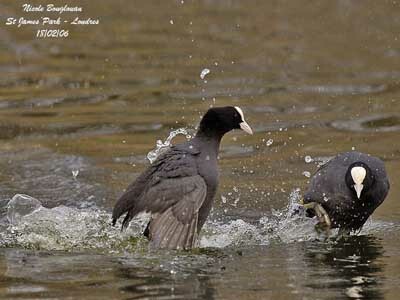 The Common Coot adult has black plumage overall, but we can notice a contrast between the deep black head and neck and the paler body which appears greyish-black according to the lighting. The secondary flight feathers are white-tipped. Underwing is paler, mostly pale grey. On the black head, we can see a conspicuous white shield. The bill is pale pinkish-white. Eyes are deep red. Legs are greenish-yellow and the lobed feet are grey. In breeding plumage, the male shows broader white shield than female. 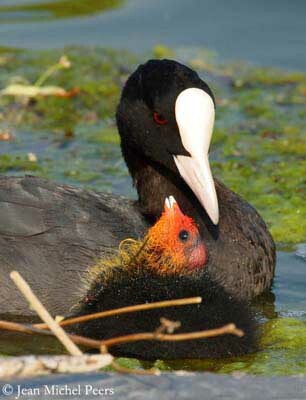 The chick is black with scattered yellow down around the head. The bare crown is reddish. The bill and the very small shield are red. Eyes are hazel to grey-brown. The juvenile has blackish-brown body and whitish fore neck and upper breast. It is paler and duller than adults. The immature resembles adults but duller and with variable mottled appearance. Chin and throat are greyish-white. F.a. atra from Europe, North Africa, Azores, Canary islands, Asia to Japan, Indian subcontinent and Sri Lanka. F.a. lugubris from E Java and NW New Guinea. F.a. novaeguinea from C New Guinea. F.a. australis from Australia, Tasmania and New Zealand. Races differ in size and intensity of the black plumage, and also in head pattern. The race “australis” (see below) lacks the white tips to secondary flight feathers and underparts are darker. The bill is pale greyish-white. Legs and feet are grey. 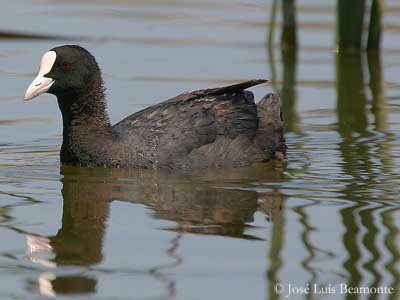 The Common Coot’s typical contact call is a short “kow”, “kowk”, “kup” or a sharp “kik”, or sometimes a two-notes call “kick-kowp”. These calls are rather metallic and resonant, but also explosive when the birds are excited. During the fights, the male gives sharp “pssi” and the female a croaking “ai”. The alarm call is a sharper variant of the previous call, but the female utters rapid series of “ai-oeu” calls. These birds are noisy. 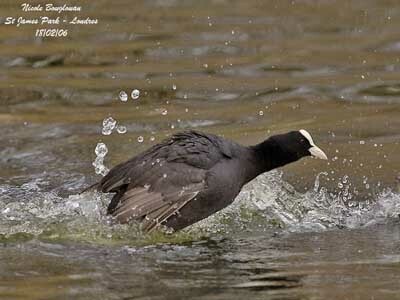 The Common Coot frequents large slow-flowing waters, and prefers shallow waters but with close deeper areas for foraging. It prefers muddy bottom with fringed, emergent, submerged or floating vegetation. The species often breeds on seasonal marshes or temporary pools. It avoids small pools and streams and may sometimes occur on fast rivers if there is suitable vegetation. 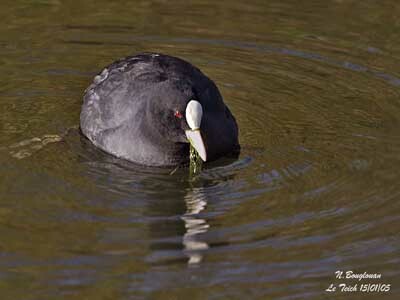 The Common Coot requires some open water areas, but usually breeds close to the banks or from floating or emergent vegetation. This species occurs in lowlands, but it can be found up to 1000 metres of elevation in Europe, and more, up to 2000 – 2500metres according to the range. 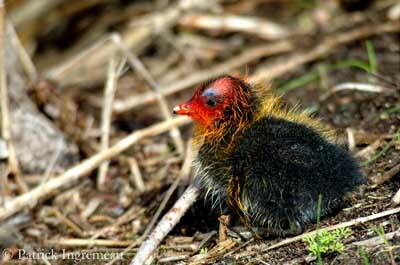 In New Guinea, it occurs up to 3500 metres and is resident at montane lakes. 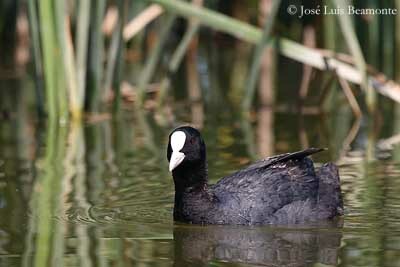 The Common Coot is found in Europe, Asia, Australia and Africa, and recently in New Zealand. 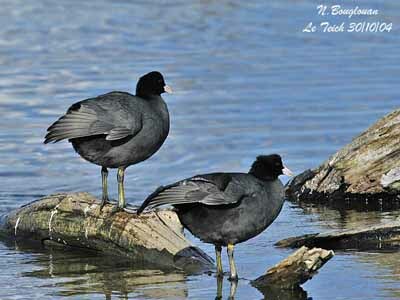 The Common Coot is resident in warm and temperate regions. The northernmost populations of Eurasia migrate southwards under influence of hard climate. Asian populations migrate southwards and westwards if waters are frozen. We can observe broad front of movement W to S, through continental Europe. There also are moult migrations, and other movements and dispersions according to the weather conditions and the countries. 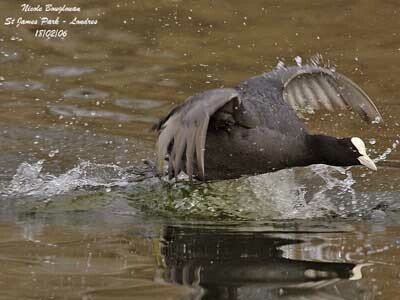 The Common Coot is omnivorous but mainly vegetarian. It primarily feeds on seeds and green parts of aquatic and some terrestrial plant species, algae, grasses and cereals. It also takes animal food such as worms, leeches, shrimps, molluscs, insects (adults and larvae) and spiders. It may take fish and fish-eggs, small frogs, small birds and eggs and small mammals. This species feeds both in water and on land with several foraging methods such as scraping algae from substrate, gleaning, dabbling, upending, diving and grazing. We can see large flocks feeding and grazing on the ground but near water, mainly if the wind causes too high waves. It also performs piracy from other bird’s species, especially swans and ducks. 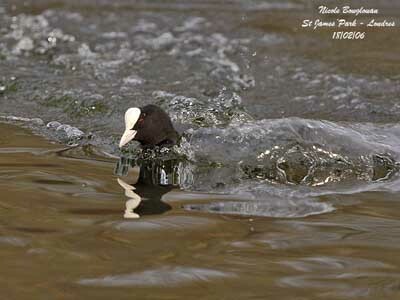 The Common Coot is diurnal but it may be often active at night on moonlit nights. It is able to dive for some seconds, about up to 20 seconds, but the food is brought to the surface rather than eaten underwater. The large items are shaken in order to break them up. 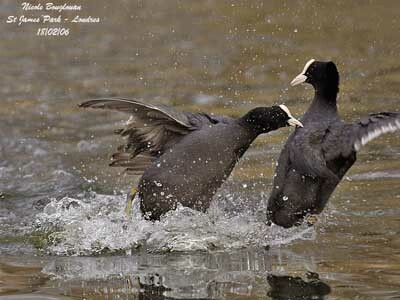 The Common Coot is territorial and fights occur between them. They start by swimming towards each other at high speed. Then, there is violent and prolonged striking with feet, clawing at the breast of the opponent and stabbing with bill. Both birds spread and hold back the wings in order to unbalance each other. 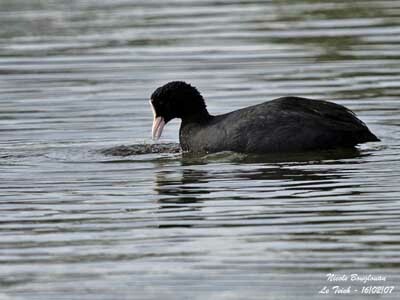 The weaker coot is usually forced onto its back or even held under water. It may escape by swimming or by fleeing among showers of water. The increase of calling usually marks the beginning of the breeding season with establishment of territory and breeding activities. At this moment, we can hear louder advertising and territorial calls. Courtship displays repertoire is limited in the family Rallidae. Displays are usually simple, with one submissive bird while the other preens, and an upright stance with arched neck and head down. 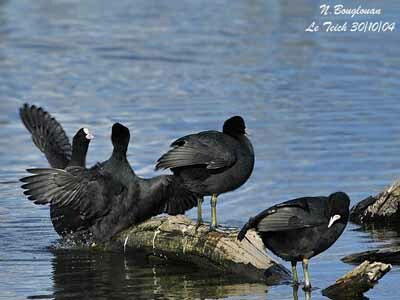 Displays may occur in water but generally, the coots copulate on land or floating platforms. Then, the male chooses the nest-site, or both mates choose it together. 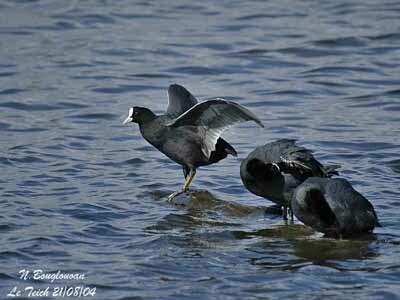 The Common Coot has short, broad, rounded wings. Its flight is rapid but not sustained and usually performed over short distances, often with dangling legs. It flies low from the ground or the water, with stronger and heavier flight than other Rallidae, but it needs long pattering run across the water before to take off. The long toes trail behind the tail. 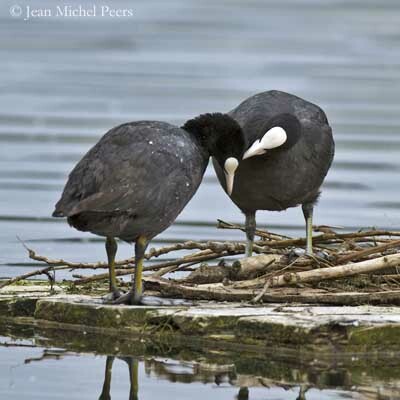 The Common Coot is monogamous. This gregarious species becomes very territorial and pugnacious during this period. 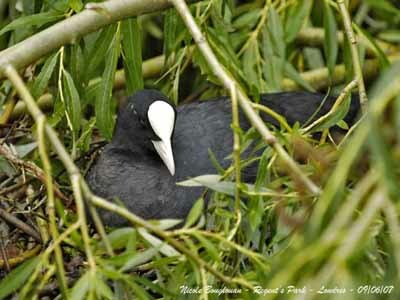 The coot usually nests in emergent vegetation and in shallow water, and sometimes in open, occasionally on floating vegetation. The nest rests on the bottom or in trampled base of plants. 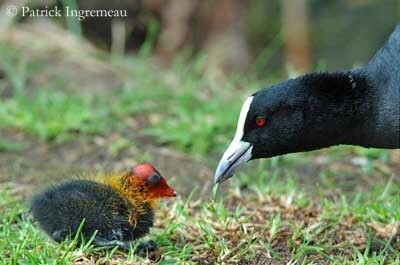 The coot can also use artificial platforms or tree stumps, or islands. The nest is bulky, made with dead and green stems, leaves and twigs, bark, roots and reeds. 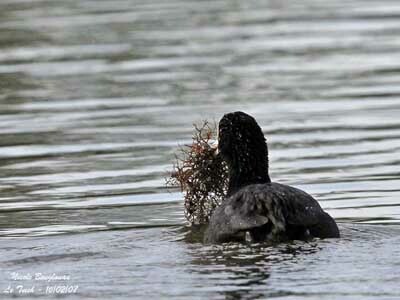 Usually, the nest is build up if the water level rises. Both sexes take part in the construction of the nest, but the brood platform for the family is built by the male. Female lays 6-10 eggs, daily or at 1-2 days intervals. Incubation by both parents lasts about 21-26 days. The chicks are precocial, but they are brooded at nest for the first 3-4 days. They are fed first bill to bill by both parents. The older young may help to feed the chicks of the following brood. They are able to dive about 3-5 weeks after hatching, and they can feed themselves at one month, but the parents feed them for up to two months and they are independent at 6-8 weeks. They fledge at about two months and can fly at 8-11 weeks of age. 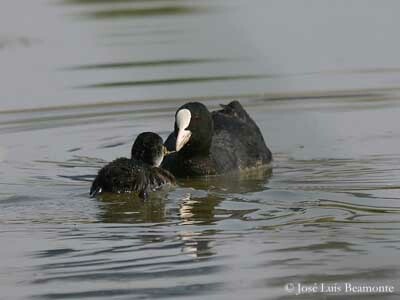 The young usually remain in the parental territory during 14 weeks and sometimes help to defend the territory. They can breed at one year, often older. 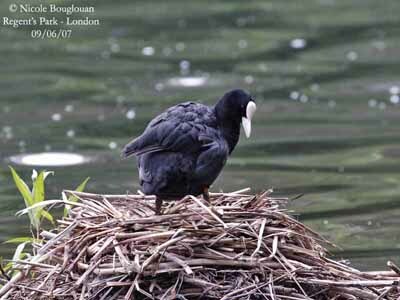 The Common Coot is omnivorous, feeding primarily on vegetal matter such as shoots and seeds of aquatic and some terrestrial plants, algae, grasses and cereals. It also takes animal food such as worms, leeches, molluscs, shrimps, insects (adults and larvae) and spiders. It may also feed on fish and fish-eggs, small amphibians, birds and eggs, and small mammals. 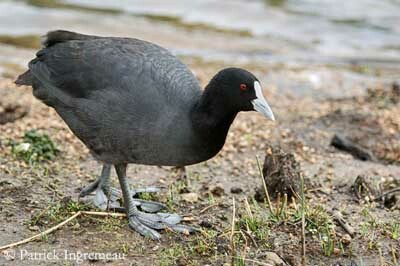 The Common Coot is relatively common within the range. This species is adapted to urban environment and man-made new habitats. In some parts of the range, oil pollution and hunting involve some declines. Drainage of wetlands is not really a problem because they adapt and rapidly colonize suitable artificial habitats such as dams. 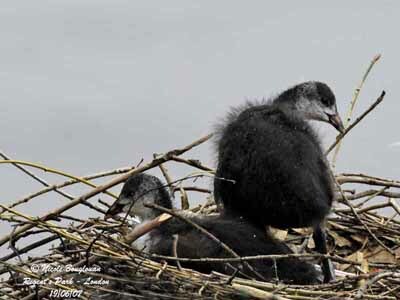 Currently, the Common Coot is not threatened.